Hi guys! I have one more Valentine's Day craft to share with you this week. If you follow along with the 11th apartment, you may be aware of my new found love of needle felting. I only recently learned to felt and this is my latest project. (Felting is super easy to learn and quickly becomes pretty addictive). 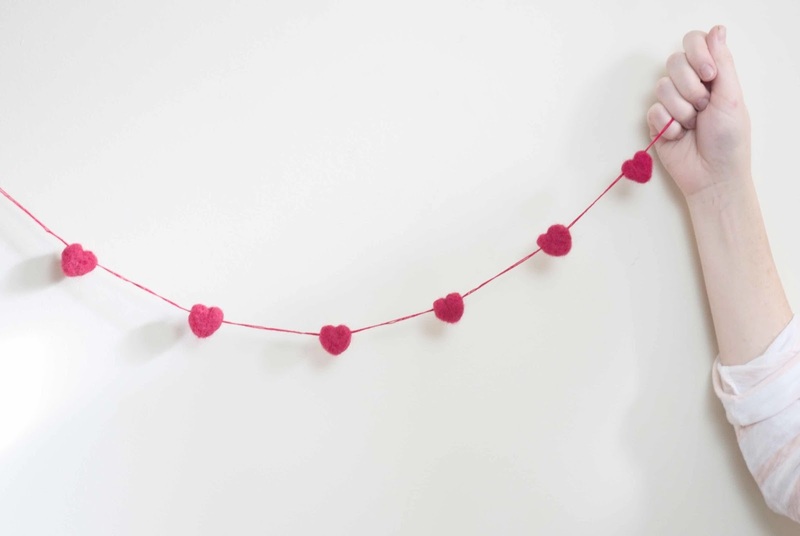 The mini hearts garland is perfect for Valentine's Day, but it's so cute (obviously!) that I think it would be quite the welcome addition to any wall at any time of year! 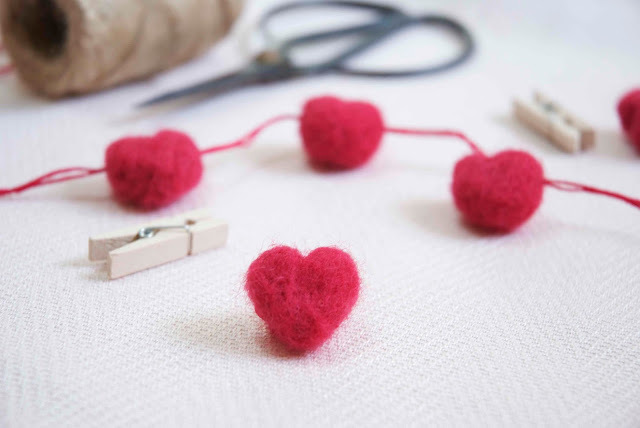 Making the felted hearts is simple. You start with a spiral of roving and felt that into a compact circle, then you take the felted circle and shape it into a heart. If you are new to felting, you may want to read my first felting post, as I explain the needle felting process in greater detail. The first thing you want to do, is to make a circle with the roving. I did this by winding a small spiral. The spiral of roving should be slightly larger than you want the finished heart to be. Begin to felt the circle by jabbing your felting needle all over the roving spiral. Jab the front and back of the spiral, and also poke the needle all around the sides. 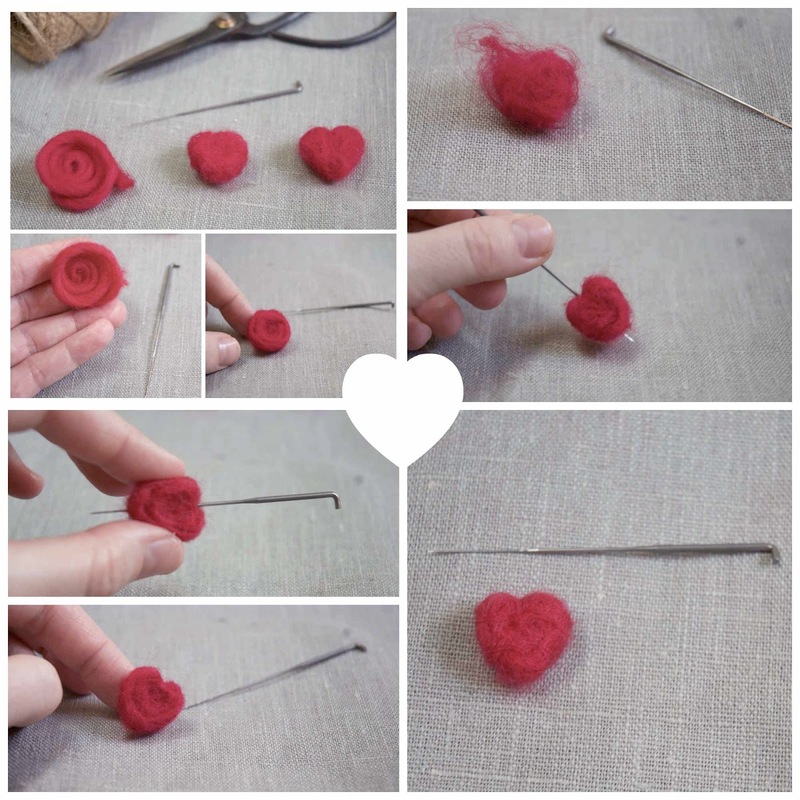 Once you have a compact, felted circle, pinch the circle between your fingers and jab it with the needle to begin shaping the heart. Repeatedly jab one spot to create the top indent and pinch the bottom and jab to form the bottom point. When the heart shaping is complete, you may still see the spiraling of the roving, or you may just want to make your heart a little bulkier. To do this, wrap the heart with a tuft of roving and felt this roving into place by jabbing with the needle. Repeat these steps to create as many mini hearts as your own heart desires! I made my garland using eight or nine hearts. 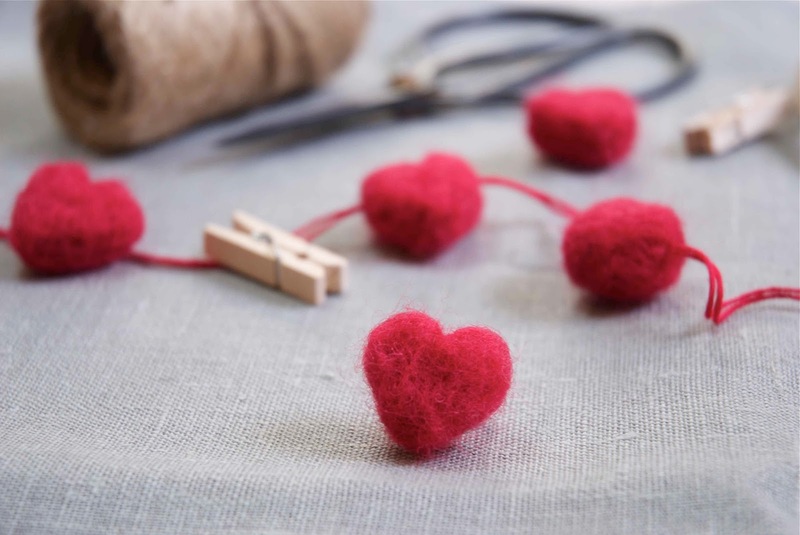 When you've finished felting the hearts, it's time to form the garland. This is super easy. Just thread a large sewing needle with embroidery thread and use the needle to string the hearts onto the thread. When stringing the hearts, poke the needle through the upper third of each heart; this will ensure that the hearts hang right side up and won't flip flop all over this place when you hang your garland. This garland is truly beautiful and glad that you shared about it here. I am looking for awesome but affordable venues in NYC for a surprise party. Thinking to do all decorations of my own to cut the costs as budget is not that big.